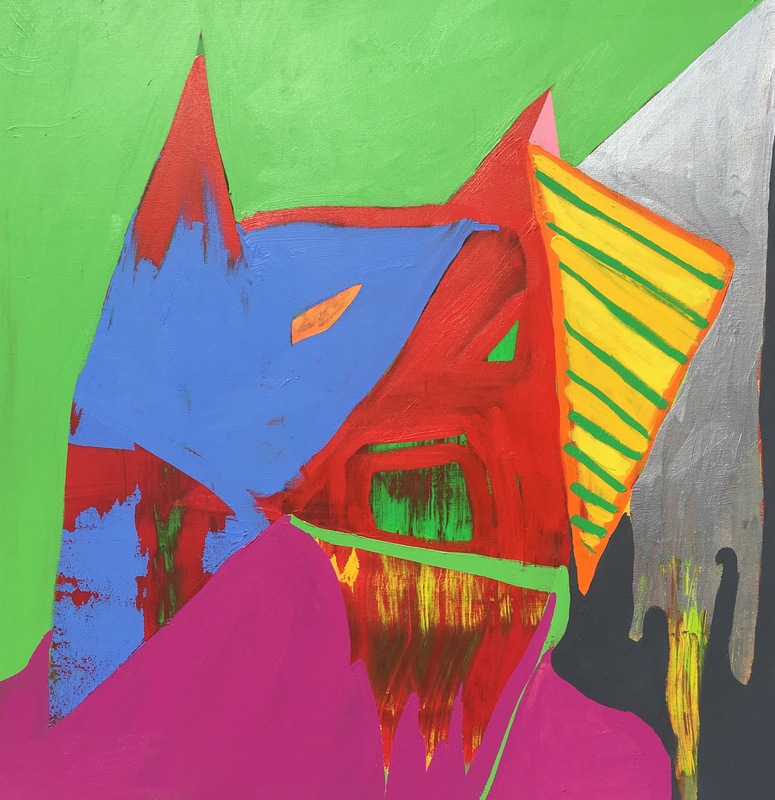 Angry Bat-God Yelling, 2017, Acrylic on canvas, 152 x 147 cm. Angry Bat-God Yelling (2017) is the first large painting completed since my show of small work in Germany last summer. In my new work I am depending less on the hard edged and non-objective forms that have been staples of my painting in favor of a quicker, more slap dash approach. The more pronounced, descriptive forms push a narrative as well as a mix of pop culture and supernatural interests to the surface. Yet the tether to a romantic ideal of modernism still holds fast. I predominantly use Golden paints supplemented with various colors by Lascaux and Old Holland Acrylics. For this painting the following colors were mixed or in some cases taken directly from the tube. Yellow green, blue green, a somewhat lightened graphite gray, various shades of cadmium yellow, cadmium orange, a lightened ultramarine blue, various reds, iridescent silver, light pink and a fluorescent orange. My palette references the psychedelic, advertisements, pop culture in general and the mythic. The Big Blue (1988), Brother Sun Sister Moon (1972), You Can’t Take it With You (1938), Cleopatra (1963), Red Dust (1932), Diner (1982), Purple Rose of Cairo (1985), 2001 A Space Odyssey (1968), Hannah and Her Sisters (1986). These were all favorites as a kid and I watched a few episodes of all of these during the time it took to finish this painting. Batman: The Mad Hatter Runs a Foul S2 Ep35/36, Star Trek, Wild Wild West and The Green Hornet. I really enjoyed this. Paul Behnke is articulate, funny and serious about painting. His paintings are great. Thanks Sharon, I totally agree.